The Battle of Stalingrad 1942-43 - simply the most savage urban battle in the history of man. 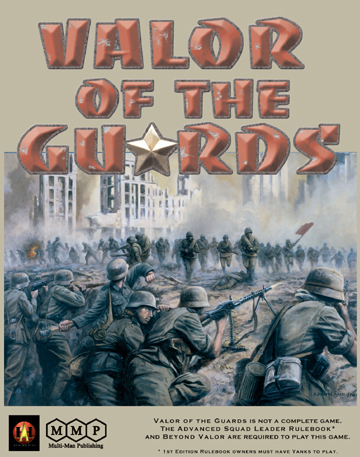 Valor of the Guards, the seventh Historical ASL module, takes ASL players to the streets of downtown Stalingrad where the German 6th Army and the Soviet 62nd Army would clash for weeks ending with the surrender of the German Army in January of 1943. The map for Valor of the Guards encompasses a vast area, extending from the north of the 9th January Square to the south of the Square of Fallen Heros ("Red Square") and from the west of the Stalingrad-1 Rail Station to the banks of the Volga and the critical ferry landings in the east. The hand-painted artwork of Don Petros brings the tortured landscape of the ruined city to life. New terrain types like gutted and partially collapsed buildings and rail cars give veterans of Red Barricades new challenges in their continued conquest or defense of Stalingrad!